A dynamic, luxurious blend of comfort, convenience and exquisite style, this 2-story, 3,393-square-foot home is an absolute haven of rest and rejuvenation! Nestled in the idyllic Mckee Plantation amongst picturesque, mature trees and beautifully manicured gardens, this residence enjoys the benefits of a truly ideal location. 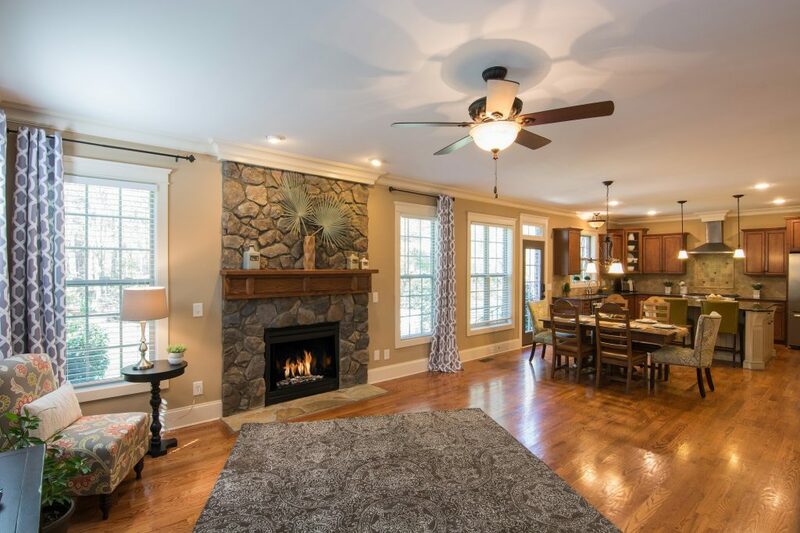 At 5414 Open Book Lane Charlotte, North Carolina 28270 this impeccable home provides peace and privacy while being a quick 20 minute drive to Uptown Charlotte. With 4 bedrooms, 3.5 baths, and a 2-car garage, this home is listed at $555,000. Inviting and filled with natural light, the main room welcomes you home in style. This spacious, open-concept living area features stunning high ceilings, rich hardwood floors, a formal dining room, and enviable crown moldings. When it’s time to kick back and relax, the stone gas fireplace allows you to turn on coziness at the mere flip of a switch! Across the great room, a gourmet, chef-ready kitchen awaits with state of the art stainless steel appliances. A dine-in island provides ample space for whipping up elaborate recipes or enjoying casual meals at a bar-style seating area. A formal dining room offers a truly sophisticated setting for serving guests: the vaulted ceiling adds to the atmosphere of luxury. Whether entertaining a lively crowd or simply enjoying a quiet evening in, the dining room strikes a refined balance between function and elegance. When it’s time to truly unwind, head upstairs to find 4 generously sized bedrooms. The master bedroom is the picture of indulgence. This master suite also includes a luxurious en-suite bath, sleek soaking tub, walk-in shower, double sinks, and a large walk in closet to to please the eye. Down the hall gather the family and enjoy time in your spacious and comfortable bonus/media room for a movie night in. On sunny days enjoy the tranquil scene from the front porch, a casual space ready for afternoons spent sipping ice-cold lemonade! Around the back of the house, a huge stone patio is just waiting to impress the guests at your next party. 5414 Open Book Lane is the perfect place for buyers to settle in and call home. For more information on this listing or to setup a private showing, please contact the listing agent Ann Rudd. Click here to see more homes currently for sale in Mckee Plantation. Thanks for commenting! I greatly appreciate your compliment and appreciation towards our blog! I find it easy to blog when you love what you do! If you’re stuck on picking a topic to write about I would google popular blog topics to get you started. Another helpful tip is practice, practice, practice. Once you’ve written a couple posts under your belt you’ll notice a process happening! This will make it easier for the next time you decide to write. Lastly, may I suggest keeping an ear and eye out for things that inspire you to sign on and type away! Good luck!